Many people know that I have dealt with medical medicinal herbs and wild edibles for most of my life. Now that I have cancer I get all kinds of recommendations on what herbs I should use. Much to my surprise I found that my chemotherapy drug is based on four herbs: mayapple, periwinkle, yew, and Chinese happy tree. 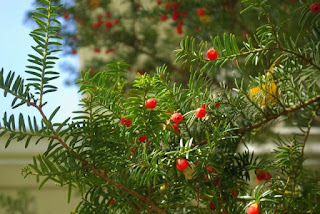 The yew tree that grows around here has a delicious berry but the seeds are very toxic. The problem is too often we so gladly give recommendations not understanding that the what part and how of a particular herb is very intricate and formulation is a very delicate balance. For instance they have found that when the mayapple is chewed on by animals it produces more of the toxins that are needed to kill cancer. Leaves that haven't been chewed on have very little toxins so in order to get maximum value out of it the leaves need crushing. Unfortunately much of this knowledge has been lost in our past and is not available to us. For those how have found chick tractors not the ideal thing for different reasons or who don't have much free range ares. Also very good if you don't have the physical strength to turn and make compost.